Finding the best 1911 trigger is no easy task. The reason being is that there are so many available on the market. Some of them are excellent, while others are just cheap models that will only disappoint you. Thankfully, we've hand-picked six of the best 1911 triggers that are currently on the market. You may find one of them to be the one you want to buy the moment you learn more about it. The quality of your trigger pull will play a role in the overall accuracy of your gun. Sure, an upgraded barrel will help you in one way. However, a trigger with a pull weight of six pounds, plus a lot of creep won't do you any favors. Especially when you hold accuracy to a high standard. The pull weight may be associated with trigger finger fatigue. This is something you've probably experienced after some extended shooting sessions. Having a loose or sloppy trigger is never a good thing to have. It should feel secured in place, but also smooth on the pull. The pull weight is always an important factor to consider. The lighter the weight, the better you’ll get a shot off in a quick amount of time. Competitive shooters are a prime group of gun owners that would want something of a light pull weight. The quicker they can get their shots off, the better. Most options available on the market are known as “drop-in” types. This means that the installation process of these products will be easy. Some tool usage may be required, but gunsmithing skills are not needed. Likewise, if a trigger is not considered a drop-in, the installation process may be more difficult for someone without decent gunsmithing skills. The following are six of the best 1911 triggers currently on the market right now. You should review each of these items carefully and make a note of some of their main features. While you might not find the perfect trigger, you can find one that will stick out as the best possible option. If you find one that you think will fit you perfectly, be sure to dig a little deeper into your research to see what the majority of users are saying. Our first trigger up for review is the PSA 1911 Trigger 3 Hole Aluminium. This item is crafted from aluminum, so it is considered to be very durable and resistant to damage and scratches. This is a strong, lightweight model which makes it tough and safe to use. This is also the perfect choice if you’re building your own 1911. There are gun owners and enthusiasts who would rather take on the task of building their own gun, as opposed to purchasing a new one. If gun building is your hobby and your current project is a 1911, you'll probably consider the PSA 1911 your best possible choice. Since it is lightweight, you might expect little to no creep and even a light pull weight. Next, we have an option that is considered the best for those on a budget. Keep in mind that if you’re on a budget, it doesn’t mean that you are limited to just cheaply made products. Cheap triggers are not the best when it comes to quality. You want a good quality item at a price that you can afford. If that’s what you’re looking for, the Wilson Combat 1911 Short Pad Trigger may be the best one you can afford. This weighs just over 80 grains, so this is very lightweight. The pad is made from aluminum that is aircraft quality, making it one of the more highly durable items available on the market. For a product that is affordable, that’s quite a steal. The pad has a matte silver finish and the bow is hardened with stainless steel. So, you’re dealing with one tough customer. Resistant to scratches, can last you a long time,...what more would you want in a 1911 trigger? The bow is polished to reduce bow to frame friction. This also comes with an over-travel screw that you can adjust easily, so you can make precise adjustments if and when you want to make them. The Wilson Combat brand is considered to be one of the most trusted names among gun owners and enthusiasts. It's not surprising that they live up to their reputation of making top-quality gun parts for their customers. For a high-quality product at a price that you can afford, the Wilson Combat is the best there is. It would be very hard to beat a trigger like the Wilson Combat. The price alone makes it a steal. Especially if you're looking for a product that might be the last one you'll ever buy for a while. It should be noted that aircraft grade aluminum is the toughest, most durable material there is for gun parts. Remember that, not only when you're searching for triggers, but also when you're looking for other accessories like scopes. For our next product, we stay with the Wilson Combat brand. 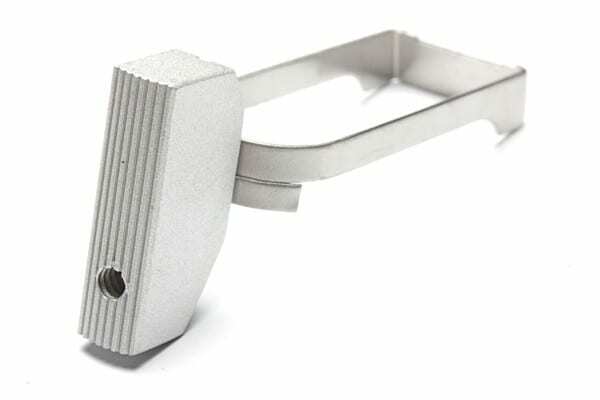 This is the 1911 Ultralight Match Trigger. The name doesn't lie. It really is ultra-light in weight. To be more specific, it weighs 90 grains. This weight doesn't compromise the quality, but it helps enhance the performance of it. Since it's so light, it gives users a very crisp feel when they pull the trigger. 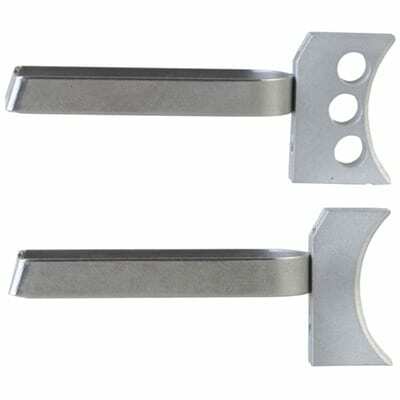 This also includes a stainless steel bow with hardened material to ensure that frame friction is greatly reduced. To enhance the design and appeal of this item, it comes with a three-holed design. This design is often synonymous with the Wilson Combat brand. Although most 1911 triggers require little to some fitting, the Wilson Combat 1911 Ultralight is one of the easiest to install. This means the process itself won’t take too long and you can use it as soon as you’re done. Once you put this to good use, you’ll immediately feel a difference between the Wilson Combat and your original factory trigger. The lightness and smoothness will enhance your 1911 like no other. This is a good item to have if you're sick of dealing with a loose or sloppy factory model. Although this product is lightweight, it will get rid of the looseness and sloppiness of your old model. Wilson Combat is proven to be a trusted brand for their 1911 triggers. No matter which one you get, you'll get a lightweight but tough item for your 1911. If you're looking for a high-quality option that will give you a light pull weight and a quick, accurate shot, get the Ultralight 1911. 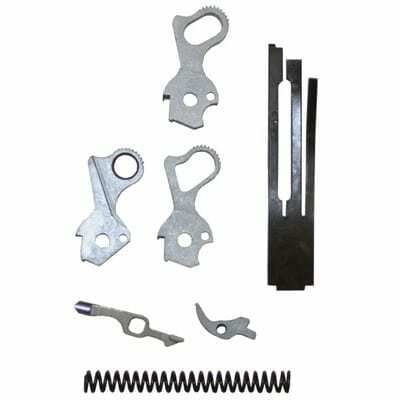 A skeleton trigger is considered to be lightweight and designed to reduce recoil in your 1911. Of all the skeleton triggers available for your 1911, the Greider Precision is best available on the market. This is a lightweight, competition option that keeps drag and pull weight to a minimum for the smoothest possible engagement and a quicker return. If you’re familiar with the Videki Speed Trigger, you’ll be surprised that the Greider has the same proven design that made the VST an industry standard. The extra stiff, high-strength bow is machined using the Class A, Videki tooling and 400 series stainless steel. The shoe is CNC-machined from top quality aluminum billet and a slightly oversized left for custom fitting. This comes with stop screws to ensure that overtravel is eliminated. This product has three holes that are designed to keep it light in weight. Skeleton triggers are good to have if you want something that’s both lightweight and durable. If this type of item is what you want, the Greider Precision might be the best option for you. Since it fits with a lot of 1911 pistols, you might like it enough to buy more for your other 1911s. Though it comes in two different designs, choose the one that best fits your style and run with it. May Require Heavy Stoning in Order to Fit Some Guns. The Harrison Design & Consulting trigger is lightweight with a solid pad. On top of that, it has the stop screw that is used to eliminate any kind of overtravel. If you're looking for an easy to install drop-in model, the Harrison is just that kind of trigger. This is one product to have if you are a shooter that wants to run their gun hard, but still wants a consistently smooth and precise trigger pull. The solid aluminum shoe gives a comfortable, natural finger position that can prevent uneven pressure that can throw off your gun’s accuracy. This has a smooth, curved face with radiused edges so your fingers don’t get abrasions. You’ll also have a choice of shoe lengths that will let you set the length of pull that concentrates the pull force on the centerline of the trigger. 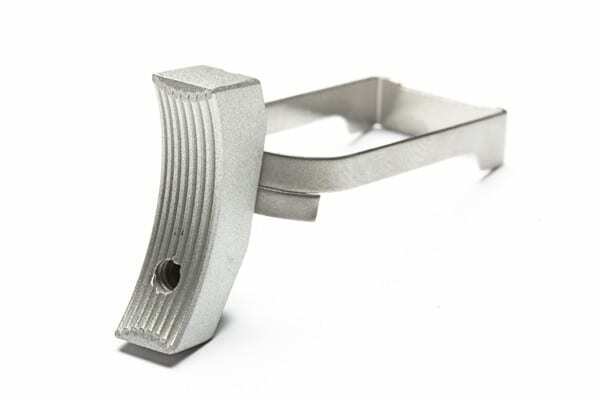 The shoe itself is permanently staked to a non-flex bow of hardened stainless steel with a mirror-polished finish surface that eliminates friction with the frame. The Harrison isn’t a bad item to have. It’s lightweight and perfect for the shooter that wants to get in some extended sessions without causing abrasions to their thumbs. Also, this is good to have if they want to reduce trigger fatigue. Very easy to install and very sturdy, the Harrison might be the product you want if you want one that is crisp and has no creep at all. Lastly, we'll take a look at the best drop-in trigger on the market. If you want an item that's easy to install, you'll need to look for the words "drop in". At this point, you know exactly what that means. Little to no fitting required? Not an issue at all. The item we'll be looking at is the Nowlin 1911 Drop-in Trigger Job. This model is ready to drop-in with a clean breaking, ultra smooth, professional quality product for your 1911. It can easily fit with most 1911 models and will work much better than the factory installed models. 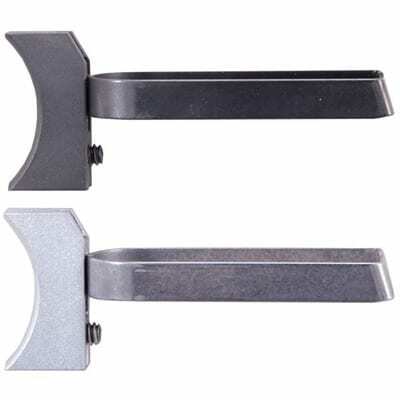 The hammer and sears are double heat-treated to ensure maximum durability. The pull weight is a light 3.5 pounds. This is the perfect choice if you plan on using your 1911 for home defense purposes. 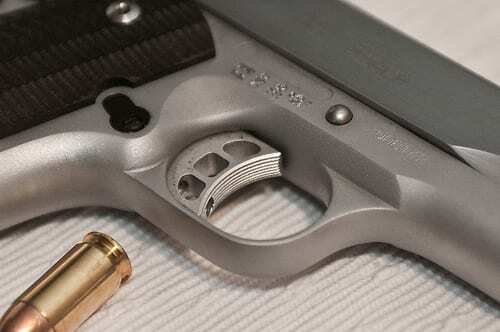 Light pull weight equals a quick shot, which is important when you're defending yourself from would-be attackers. This is the one trigger where no one complained about fitting. Therefore, it's probably the easiest to install product on the market. While others claim to be drop-ins, sometimes that may not be the case. If you want a no problem drop-in model, the Nowlin may be your best bet. Remove the slide and slide barrel. You’ll need to concentrate on the frame. Remove the mainspring housing by punching out the pin. Once it’s out, the housing can be removed. The grip safety should be taken out at this point. Take out the sear spring and set it aside. Remove the larger of the two pins that hold the hammer and hammer boon in place. Follow it by removing the smaller pin, which holds the sear and disconnector. Next, you’re going to need to remove the trigger bow. In order to do that, you’ll need to disassemble the magazine release. Once it’s out, the trigger should slide out the back of the frame. Slide the trigger you want to install through the back of the frame. Be sure to move it back and forth to see if it can move freely. The more freely it moves, the better. Replace all the parts in the reverse order. Start with replacing the magazine release. Once you replace it, test the trigger for movement. For best results, install an empty magazine and check it for function. Once you’re all clear, replace the parts in the reverse order of which you disassembled it. Finding the best 1911 trigger doesn't have to be a challenge. You can find one that will help your gun function much better. Remember to consider the factors and unique features before making your own decision. A good trigger should not only make your shot more accurate but should also improve the overall function of your 1911.